Ashley Tabatabi has been on a roll, with a recent string of successful films, including the Feature "Allies". It has now been confirmed that the actor is set to be represented by LA agent Cavaleri & Associates. A move that is set to project his career to the next level. Tabatabai, is also known for his involvement for being involved as a Producer on some of the projects he has worked on. Namely the Film "Digital You". And now on the upcoming Pilot "Color Me Grey". The project is scheduled to start filming in Europe in May 2015, with Ashley in one of the lead roles. It follows the inner workings of a crime organization that uses everyday people to fulfil its needs. The original concept is set to be pitched later this year upon completion of the Pilot episode. The new partnership between the actor and Cavaleri & Associates marks an exciting period for the rising star, whose in projects are now set to be complemented by more roles in US Films and TV Series. The latest feature film from director/screenwriter Stephen David Brooks http://www.stephendavidbrooks.com will have its World Premiere at ECU The European Independent Film festival in Paris, France http://www.ecufilmfestival.com/en/saturdays-programme-les... on Saturday, April 11 at 15:48. Immediately following the screening will be a Q&A with the director and cast. Set in the San Fernando Valley outside of Los Angeles, FLYTRAP is the feature follow up to Stephen’s multi-award winning feature debut HEADS N TAILZ. The first sneak peak teaser for FLYTRAP has been released and can be viewed online at https://vimeo.com/83904909. The film stars Jeremy Crutchley (Salem) http://jeremycrutchley.com and Ina-Alice Kopp (Departed Heroes) http://www.inaalicekopp.com as well as Billy ‘Sly’ Williams (Marriage Chronicles, Who Can I Run To) and Jonah Blechman. Casting is by Stanzi Stokes. The screenplay for FLYTRAP was developed in collaboration with Jeff Lyons of Story Geeks,http://www.storygeeks.com using his "Rapid Story Development”. The film was shot by David R. Hardberger with the new Blackmagic Design Pocket Cinema Camera and will be one of the first features to use this cutting edge cinematic technology. Producers on the project are Tamara Sayiner and Brittany Mayti. Chelsea O'Toole was recently brought on by the A.M.W Talent Agency for theatrical representation. Chelsea has been fiercely making waves as a young and ambitious actress whose tenacity can be seen in this recent partnership. A.M.W Talent Agency prides itself as being an entertainment firm of supreme business practices with a talent-oriented focus in Los Angeles, CA and has a reputation for building strong individuals who are creating acting careers, and not just 'jobs'. O'Toole's excitment about the newfound relationship is nothing less than ecstatic. She and A.M.W are beginning to plan the next stages of her career and those plans couldn't have come at a sooner time. O'Toole is fueling her already recent success of a supporting role in the film “Maternal Bonds" and the lead in her self written webseries "MakeOver". Chelsea shares that she feels the industry is moving in a positive direction despite the competition in the entertainment market which can prove to be jarring. Always maintaining a sense of optimism and energy she says, “I'm here doing what I love to do”. To add icing to the cake, O'Toole will also be the lead star in the re-boot of the sold out phenomenal show "Branson the Sitcom" this summer, which had nothing but positive reception. The sitcom pilot presentation debuted as a stage play last year in the LA area and has been bestowed the previlage of being apart of the Hollywood Fringe Festival, the largest performing arts festival in Los Angeles. People have praised it saying, “... this show was absolutely fantastic and I hope [it] gets viewed by many!" Top Atlanta child actress Aja Wooldridge’s first 2015 feature film debut will be the popular young adult dystopia “Insurgent”. This is the second of the four part movie franchise adapted by author Veronica Roth. Last year blockbuster hit Divergent had record breaking box office numbers. The second series is slated to exceed all expectations and expected to bring in higher box office sales. Reviews have given Shailene Woodley a very solid performance in the movie. Aja Wooldridge plays the part of the Amity Faction Children. Amity is one of the five factions in the world of Divergent. They believe in being peaceful, kind, forgiving, trustworthy, being self-sufficient and remaining neutral. Amity was formed by those who blamed war and fighting for human nature's faults. Their substance in the “Choosing Ceremony” is soil, which is symbolic of them doing the farming for all the factions. Significant portion of the movie was filmed at a small farm called the Serebe Community at about 20 miles southwest From Atlanta, Georgia. Aja filmed for nearly the entire month of June 2014. It was an exciting time to be onset. All the cast and crew had to deal with lots of dirt, heat, bugs, and many injury’s. Aja still enjoyed working everyday despite the brutal climate and setting. Aja Wooldridge a.k.a. AjaModel, is a very popular child model and actress in Atlanta, Georgia. This highly sought after talent has completed over 50 fashion shows and worked on over 25 different filming projects. Aja has been blessed to work with many talented people such as Robin Givens, Darrin Henson, Cynthia Bailey, and many more celebrities. Helomedia Oy is producing a documentary film on Finnish folklore and mythology, and seeks a worldwide audience by providing the film in two different versions - one spoken in native Finnish and another spoken in English. Principal photography has been completed on the heels of a record-breaking late 2014 crowdfunding campaign, and the film is currently in post production. Starring musician, songwriter and poet A.W. Yrjänä - from the band CMX - in the role of the presenter, both Mr. Yrjänä and Helomedia Oy are on a mission to introduce a little-known set of ancient beliefs, deities and traditions to a worldwide audience enamored with better known Norse and Greek mythologies. The production team sees the film as a way to express their own respect for their pre-Christian ancestors, and presenter A.W. Yrjänä has a deep vested interest in the subject matter. The film is a passion project rather than a commercial one, and the grassroots nature of the effort is exemplified in the way it has gained recognition. As a result of a minimal marketing budget, publicity and demand for the film have been generated solely by an audience feeling a connection to the subject matter and wanting to spread the word. The Hammer of Ukko is set for completion in late summer 2015, and its release is tentatively planned for autumn of 2015. Helomedia Oy is looking for partners in different markets to secure distribution to a wider audience. Helomedia Oy, founded in 2014, is an indie production company based in Hämeenlinna, Finland, consisting of three full time employees. A.W. Yrjänä is an internationally recognized frontman of the band CMX, an author and poet, whose life’s work has always been inspired by Finnish mythology. Wishing you all a very Happy St. Patrick's Day 2015 from all of us at the Daily Film Forum. The single "And I Hold On" is featured in the film "Days of Power" that is based on Milow the Girl and her previous United States Days of Power tour. The film stars indie musicians and actors from all over the world and has special appearances by animal rights advocates Eric and Eliza Roberts, Simone Reyes and Milow the Girl herself. The CD also includes songs that have previously only been available in the UK. The UK hit "Distraction Timothy Allan and Loverush Remix" reached #14 on the New Music Week's Commercial Pop Chart. To find out more about Milow the Girl and upcoming tour dates you can visit www.milowthegirl.com or visit her page on the Realize Records website at http://realizerecords.com/Artist/Milowthegirl. You can also follow her on twitter @milowthegirl and on Facebook at the Official Milow the Girl Fan page. The Projection Booth podcast has explored over 200 films in the last four years. A seven hour podcast about John Milius's 1982 film Conan the Barbarian. "We're not just about length," assures Projection Booth co-host Mike White. "We go for depth and breadth. We hope that this episode is a fitting tribute to Robert E. Howard's creation, Arnold Schwarzenegger's portrayal, and John Milius's remarkable film." Oscar Night surprise for DEADLY REVISIONS as it wins “Best Picture” in the Flicker Awards! Gregory Blair’s slow-burn, psychological thriller DEADLY REVISIONS has just nabbed “Best Picture” in this year’s Flicker Awards. The winners of annual awards presented by movie site Matchflick.com were announced on Oscar Sunday, just prior to the start of the Academy Awards. Not that Blair hasn’t already picked up a handful of awards. He’s been the recipient of the EOTM Award for “Best Director of an Indie Horror Film,” the Claw Award for “Best Feature Film Screenplay” and the L.A. Movie Award for “Best Narrative Feature”—all for DEADLY REVISIONS. The film has also picked up laurels for its actors: lead Bill Oberst, Jr. won the L.A. Movie Award and the FANtastic Horror Film Festival Award for “Best Actor” and Cindy Merrill took “Best Actress” in the FANtastic Horror Film Festival. In DEADLY REVISIONS, Oberst, Jr. plays Grafton Torn—an amnesiac horror film writer for whom hypnotherapy and nightmares reveal terrifying images that just can’t be real. Or can they? It’s a twist-filled psychological thriller as well as a loving valentine to the horror genre with winks to horror greats, including Hitchcock, DePalma, Carpenter and others. DEADLY REVISIONS will be distributed through SGL Entertainment later this year. 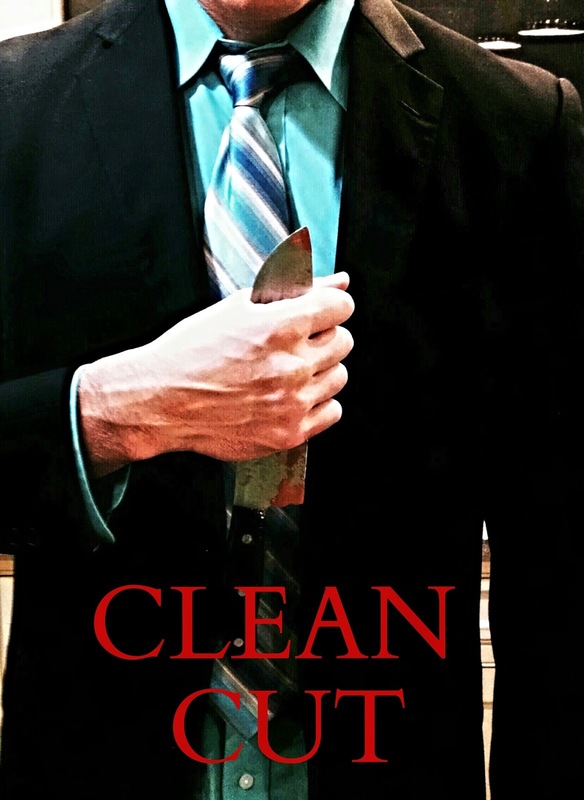 SIGN ON TO STAR IN NEW HORROR / THRILLER "CLEAN CUT"
Production is announced today for the psychologically disturbing new Horror / Thriller feature film "Clean Cut." From mind of Award Winning Actor Keith Collins ("Gravedigger","The Meat Puppet") and the profound ink of two-time NY Emmy Award Winning Writer Joseph Pepitone and Billy Pepitone ("Stuck in the Middle","The Jersey Devil") comes one of the most chilling stories heading to the screen set to make you squirm in your seat with terrifying, heart pounding, fear and fright. Murder, blood, torture and psychotic thoughts will race through your head while watching this journey of paranoia unfold, permanently deranging the movie goers mind. STARRING: Keith Collins, Doug Bollinger ("Waltzing Anna"), Samantha Artese ("The Coffee Shop"), Michael BIlly ("The One") WITH Billy Sample ("Former NY Yankee"), Gervase Peterson ("Survivor") AND Ron "Bumblefoot" Thal ("Guns N' Roses"). Directed By, Joseph Pepitone. Produced by, Keith Collins. Executive Producers Steve Wolf ("Lady Peacock"), Jonnie Rockwell ("The Anthem"), AJ Mattioli ("Words"), Cory Green ("Rebel"). CO-Executive Producers Doug Bollinger, Joseph Pepitone. Cinematography & Edited By, Cory Green. Story By, Keith Collins. Written By, Joseph Pepitone and BIlly Pepitone. Original Music by, Ron "Bumblefoot" Thal. A new stageplay is set to hit the scene in South Metro Atlanta this April entitled “The Strength of Love.” This stageplay, a Baz Brothers Production, will be held in two shows on Saturday, April 18, 2015 at 2pm and 7pm at the Griffin Auditorium, in Griffin, GA.
Paula Campbell is a talented songstress from Baltimore, MD who has served as the opening acts for top artists such as Ne-Yo, Tre Songs, Ciara, Rihanna, Kanye West and T.I. She has been a signed artist for Sony Urban and Columbia Records and has also independently released billboard charting singles and LPs. She has been seen in music videos for Jamie Foxx and John Legend, commercials and TV shows ‘Constantine’ and ‘Resurrection’. She had a role in the HBO International Latino Film Festival’s ‘Best Movie’ Inside a Change, and had a lead role in the theatrical production “Can a Good Woman Change a Bad Man.” In addition to acting and singing, Paula is a gifted dancer, songwriter, arranger, painter and spoken word artist. Legendary Jazz, R&B and Gospel artist and actress Chandra Currelley plays Melody’s mother in the play. Chandra Currelley, who also starred in “A Mother’s Love”, is best known for her various roles in Tyler Perry productions “Diary of a Mad Black Woman”, “Madea’s Big Happy Family” and TBS’s “For Better or Worse.” As the former lead singer for the popular recording group, the S.O.S. Band, Chandra is the 2014 recipient of the Lady of Soul Jazz award. A Gospel Choice award nominee, Chandra has performed at the White House and toured the US, Europe and Asia. Her theatrical performances span several years and productions, including “Jesus Christ Superstar Gospel”, “What’s Done in the Dark” and “Rejoice” with Kenny Leon. Her performances have been seen at the Alliance Theatre, Fox Theatre and several others in the Atlanta area and around the country. Baz Brothers Production is an independent production company based out of Atlanta and New York. Created by Jeff and Kendrick Bazile in 2003, their mission is to bring the best and most creative stories to the masses by writing, directing and producing quality work. Jeff Bazile, is a writer, director and co-owner of Baz Brothers Production. Hailing from New York, he started his career in film at age 16, studying film production and acting. He has a MBA in human resources and project management and has over 10 years’ experience writing, directing and producing films. His wife Maria has co-written, co-produced and serves as the production manager for many of the BBP projects. She has a Master’s degree in Leadership and has several years’ experience in theatre, modeling, acting, makeup, PR, advertising and event planning. She plays a huge role in casting, coordinating premiers and managing the overall business. Jeff, Maria and the cast can be heard promoting the play in interviews on Love860AM, Source B Radio on BlogTalk, Sean Pryme Show on Sensation Station Network and Urban Grandstand and ImagineI Magazines. Their commercial is on WIGO AM1570, and the station is also running a contest to give away tickets to the play. Connect with Baz Brothers Production on social media athttps://www.facebook.com/BazBrothersProd and https://twitter.com/bazbrothers.